Time of Origin: Encountered The Doctor on Earth in San Francisco, October 2002; precise point of origin in time and space unknown. History: Although his exact origins are unknown - he was shown to be capable of operating in the higher dimensions of reality, but it is unclear if he naturally dwelled there or was on some stage between our plane and the higher realms, particularly since his race were implied to have evolved on the mysterious Needle, a structure from a parallel universe that existed on the edge of a singularity ("The Infinity Doctors") -, Griffin proved to be a highly dangerous adversary for The Doctor. In some ways, Griffin could be compared to the Seventh Doctor's enemy Light ("Ghost Light"), as each of them sought to catalogue other species but were only interested in doing so on their own terms. However, while Light sought to destroy life on Earth to ensure that his catalogue remained accurate, Griffin's plans were far more dangerous, due to him being the worst kind of scientist; faced with data that contradicted what he already 'knew', Griffin sought to make the new data fit his theories rather than alter his own views to accommodate this new information, essentially believing that the universe was wrong rather than consider that he might not understand something. Seeking membership into an unknown Society, Griffin was attracted to our plane of existence when he discovered the existence of a pan-dimensional scar in San Francisco, created due to the damage reality had sustained when The Master opened the Eye of Harmony as part of his attempt to kill the newly-regenerated Eighth Doctor ("Doctor Who: The Movie"). Although The Doctor had averted the worst of the destruction that could have been caused by the Eye being opened, he had left San Francisco without confirming that the damage had fully stabilised, and the resulting damage to reality had created a temporal scar that was drawing various seemingly supernatural creatures to it; when he discovered the scar in 2002, The Doctor was only able to temporarily stabilise the worst of the damage it was causing by leaving the TARDIS in the scar while he sought an alternative. Drawn to San Francisco by the scar, Griffin became obsessed with analysing it to ensure his membership into an unidentified Society, utilising his ability to manipulate biodata to analyse the scar and capture some of the species drawn to it from other dimensions, including unicorns, dragons, chimeras and a kraken. As he assembled his collection, he became aware of The Doctor's presence as The Doctor's companion Fitz Kreiner attempted to investigate the scar when Fitz made contact with everyone Griffin had spoken to. The Doctor's own investigation was hampered as his other companion, Samantha Jones, had fallen into the scar, resulting in the creation of a dark-haired, grimmer, fundamentally self-destructive version of Sam who was never in a position to travel with The Doctor; The Doctor and blonde Sam had encountered evidence of this other Sam in the past ("Alien Bodies", "Seeing I" and "The Taint"), but were still unaware of her origins or which Sam was 'real'. 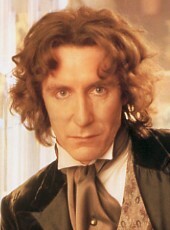 As Griffin became aware of The Doctor, he became determined to 'pin' The Doctor down, rejecting The Doctor's complicated and conflicting biodata - there were allegedly at least seventeen different versions of The Doctor's past recorded in the biodata, such as The Doctor's birth from the Loom, his history as the Other ("Lungbarrow") or his half-human heritage ("Doctor Who: The Movie") - in favour of working out a way of precisely defining The Doctor as one thing regardless of how this would limit The Doctor in the future, believing that this would ensure his acceptance into the Society. He was also determined to observe the approaching Krakken - a massive pan-dimensional life form - as it passed by the city due to it being attracted by the scar, despite the fact that this would destroy San Francisco. Despite The Doctor and Sam being captured, The Doctor managed to escape after Sam slipped him a pair of pliers, but his attempts to contain the scar continued to meet with failure, the situation having reached a point where removing the TARDIS would expose the scar and attract the Kraken directly while leaving it in the scar might cause the plasmic shell to contain the scar for good when it collapsed. Convinced that The Doctor's insanity was causing the unstable biodata to damage reality, Griffin developed a 'new' biodata for The Doctor and Sam that would pin them down as one thing - The Doctor's new biodata designed to turn The Doctor into a human while Sam's was initially assumed to be blonde Sam's biodata -, but Sam was able to dispose of both samples, allowing The Doctor to trap Griffin in his own specimen box when he attempted to access the scar directly. Although The Doctor removed the TARDIS when he couldn't bear to let it die in the scar, he gained another chance as Griffin escaped and attempted to torture him by tearing his biodata through the higher dimensions; after Sam restored the blonde Sam to follow a plan The Doctor and her had come up for this kind of situation, Sam was able to seal the scar by throwing Griffin's specimen box into it. The box's transdimensional nature allowed it to serve the same purpose as the TARDIS by collapsing the scar, with Griffin being trapped in the scar in the process (Although it was unclear if this would actually kill him or just incapacitate him while sending him 'home') while the Kraken retreated as Griffin's other specimens were returned to their points of origin.